Terror has come to this small town in Prairie County, Montana. A sinister killer is on the loose. A serial killer who feeds off of young women’s fear…and leaves a most unusual calling card. Police Chief Nathan Sommers is on the hunt, but every road leads to a dead end. My family and I had taken a day trip to Mammoth Cave in Kentucky. They had recently found a new entrance, but you had to take a bus to get there. Okay, so we get on the bus. As I’m looking around, I happen to take notice of the driver. He looked as if driving the bus was his day job, and at night he went back to his prison cell. So, with my imagination being what it is, I immediately began to think about a story involving a serial killer in a small town. We live by a lake, so I decided to center it around water. 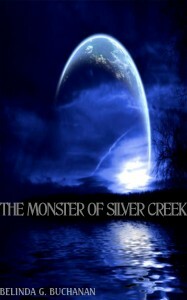 Seven weeks later, The Monster of Silver Creek was created. I adore tall, dark, and handsome-mixed with brooding. Police Chief Nathan Sommers is the central character who is grieving over the loss of his wife. Her death, he feels, is on his hands and he is mired in guilt. Nathan isn’t perfect, but even heroes have a chink in their armor. It’s what makes them human, and adds a certain vulnerability to them. It was well after nine by the time Nathan finally arrived home that evening. He flipped on the light by the door and sat down in his brown leather recliner as the living room illuminated. He pressed his shoulders into its worn cushion and closed his eyes, trying to shut out the day. But Missy Rosenberg’s face, as well as the cries from her mother, still lingered in his mind, making it impossible to do so. A bitter sigh fell from his lips as his eyes snapped open. During his years spent as a homicide detective, he’d always felt that it was his job to bring justice for the dead. Putting the killer behind bars gave him a sense of satisfaction that he was bringing closure to their loved ones. Over the last few weeks however, he’d slowly begun to realize just how wrong he was. For when darkness fell at the end of the day, those that had fallen prey to evil would still be dead…and their families would still be grieving for them. I am an author of edgy, women’s fiction, and mystery romance. Hailing from the bluegrass state of Kentucky, I currently reside there with my husband, two sons, and a menagerie of animals that includes, two persnickety cats, one hamster, and one dog that thinks he’s a person.